July 09, 2018 at 8:49 pm. 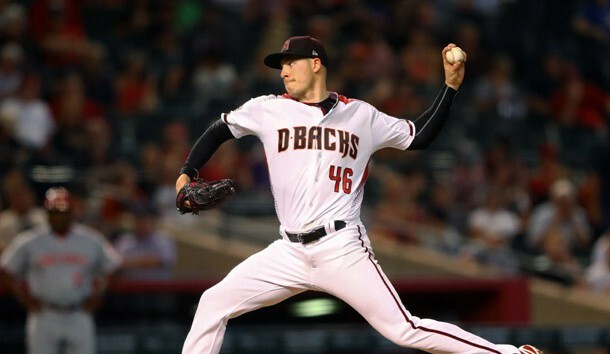 DENVER — Left-handers Tyler Anderson and Patrick Corbin, both of whom have pitched exceedingly well lately, will oppose each other when the Colorado Rockies and the Arizona Diamondbacks begin a three-game series Tuesday. Anderson (6-3, 3.90 ERA) has pitched eight scoreless innings for the Rockies in each of his past two starts, winning both outings — 3-1 at the Los Angeles Dodgers and 1-0 over the San Francisco Giants — while allowing six hits and three walks with 17 strikeouts in 16 innings. He’s the third pitcher in franchise history with consecutive outings of at least eight scoreless innings, joining Ubaldo Jimenez in 2010 and Jason Marquis in 2009. And Anderson is the first pitcher in Rockies history to accomplish that feat while allowing four or fewer hits in each start and the first in the majors to do it since Jake Arrieta for the Chicago Cubs in 2015. Anderson has a 2-0 record with a 6.67 ERA in seven games (five starts) against Arizona. His first start this season was March 30 at Chase Field, where he allowed five hits and seven runs in 2 1/3 innings of a no-decision as the Rockies lost 9-8. Corbin, who was named Sunday to the National League All-Star team, is 0-0 with a 0.95 ERA in his past three starts — two of which the Diamondbacks lost — with three walks and 13 hits allowed and 23 strikeouts in 19 innings during that stretch. Corbin is 8-3 with a 4.68 ERA in 18 games (17 starts) against the Rockies. He beat them at Chase Field on Opening Day when he gave up two runs in 5 2/3 innings. Corbin was an All-Star in 2013. But in his final spring tuneup in 2014, he tore the ulnar collateral ligament in his left elbow and underwent Tommy John surgery. It has taken longer than Corbin expected, but he has returned to his pre-surgery All-Star form. The Rockies (46-44), who were off Monday, had their season-high five-game winning streak end Sunday with a 6-4 loss at Seattle, but they have won eight of their past 10 games. Colorado will finish play before the All-Star break with a six-game homestand, with the Seattle Mariners following the Diamondbacks to Coors Field, where the Rockies have won three straight, improving their home record to 18-22. “We’ve been playing well for a couple of weeks, so we’ve got to continue,” Rockies manager Bud Black said after Sunday’s loss. The Diamondbacks (50-41) have won five of six games from the Rockies this season and will reach the All-Star break with a six-game road trip that also will take them to Atlanta. After going 8-2 on their last road trip, the Diamondbacks stumbled and went 3-7 on a just-concluded homestand. The final game was a bitter defeat as the Diamondbacks fell 4-3 in 16 innings to the San Diego Padres in a game that lasted five hours and 31 minutes. After Sunday’s marathon, Lovullo said his team would get “a well-needed day off” Monday.